This item is expected to ship 4-6 weeks after the event on April 29, 2019. Are you feeling challenged or stuck with your clients? Need new ways to help them combat negative self-talk, mood disorders, and physiological challenges? 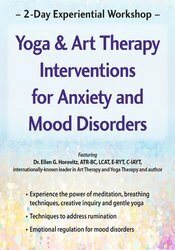 By combining yoga and art therapy techniques you will discover new and innovative ways to help your clients reduce physiological manifestations and mood disorders and replace rumination with healthy behaviors and thinking. Watch Ellen, international speaker, author, expert art therapist and yoga therapist, to experience firsthand how to combine creative arts, present moment awareness, yoga, and self-compassion with your clients to calm worried minds and soothe painful emotions. Open the creative pathway for transformation and learn how to calm your central nervous system through yoga and witness your experience through creative artistic exploration. You will leave this recording personally restored and confident in your ability to lead your clients towards creative expression, greater peace, transformation and mood regulation.